By Bill Joiner, President, ChangeWise. companies need leaders who embody a corresponding level of agility. competencies needed in their companies today.1 What is leadership agility? In essence, it’s the ability to lead effectively under conditions of rapid change and mounting complexity. Because these trends affect all managerial levels, this is a competency that’s increasingly needed not just in the executive suite but throughout the organization. Research reported in Leadership Agility, a book I co-authored, shows that managers grow through multiple stages in the mastery of this vital competency. 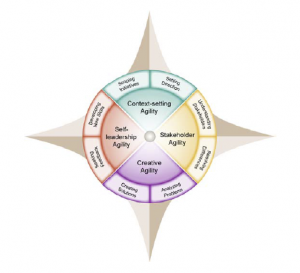 Each new level of agility represents an ability to respond effectively to an increased level of change and complexity. Strikingly, this research indicates that only about 10% of managers have mastered the level of agility needed for consistently effective leadership in today’s turbulent world economy. I came across my 2009 Paper Room output recently; my notes and photos of flip chart pages. Incredible material, prescient! It is more than ironic that my happy and rewarding life today includes a huge amount of the activities and time allocation imagined in the PR exercises in 2009. Your facilitation, indeed, did identify what I wanted and needed for an aligned and satisfying professional and personal like. I never imagined that I could or would be able to deliver against these dreams. I was never aware of actually working on the goals, but it would appear that the work planted and invisible seeds. I have the life to prove it. Bravo to you, and to me.